This film, by Director Rian Johnson, of "Brick", is a quirky, offbeat tale about two brothers, Bloom and Stephen Bloom, who spend their whole lives, since birth, as con men, abandoned as children by their con artist father. 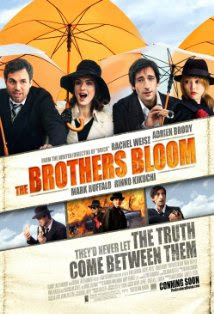 Bloom, played by Adrien Brody, is the schill, with his role in life always changing along with the scripted movements of the con. Due to that fact, he has no idea of who he really is. Where does the con leave off and the real him begin? With this in mind, after 35 years, he quits. Three years later his brother Stephen, played by Mark Ruffalo, finds him, asking Bloom to perform one last con that will set them both up for life. The "mark" is an epileptic heiress with a penchant for art and literature. She is a very mysterious, and attractive woman. When the plans to involve her in a car accident involving Bloom go wrong, the con goes awry, and Bloom comes to the aid of his would be mark, who has had an epileptic seizure due to the accident. Stephen, not wishing to let go of the con, comes up with an alternate plan, which involves a world trip. When the script becomes the non-script, and the con artist becomes his own mark, things get a bit complicated. The success of any con is judged by each party to the con getting what he, or she wants. Or thinks that they want. In the end, when people go off in search of themselves, it's often interesting to see just whom they find. An unusual movie, with a great soundtrack, and inspiring acting, this is an upbeat film which manages to stay grounded enough to feel "real." With good direction by Rian Johnson, who also wrote the script, this is a good and carefully nuanced film.